The gas giant Jupiter, the largest planet in the Solar System, has two and a half times the mass of all the other planets combined. On this date, it will be closest to Earth during 2016, which means it will be at its brightest. Using a telescope or good pair of binoculars, you will see Jupiter’s four largest moons – Io, Europa, Ganymede and Callisto. Look for Jupiter in the direction of the constellation Leo. The planet will be visible for all night, arriving at its highest point in the sky around midnight local time. This meteor shower stems from dusty particles shed by Halley’s Comet. Luckily, this year there is a new moon near the shower’s peak. The best viewing is an hour or two before dawn and it’s best seen from the Southern Hemisphere. This shower has a broad peak, meaning that although it’s best seen May 6 before dawn, it’s likely to produce a fair number of meteors the day before and the day after as well. Those in the Northern Hemisphere can expect around 10-20 meteors per hour while residents of the Southern Hemisphere may be able to see three times that many. Look for these meteors in the southeastern night sky. Saturn, another gas giant and second largest planet in the Solar System, will be closest to Earth during 2016 on this date. It will be visible all night long and reach its highest point in the sky around midnight local time. Look for Saturn toward the constellation Ophiuchus. Using a medium-sized or larger telescope, you’ll see Saturn’s magnificent rings and some of its moons. Each August for at least the last 2,000 years, the Earth’s orbit has swept through the debris of comet Swift-Tuttle, resulting in the Perseid meteor shower. While the comet won’t return to the inner solar system for more than 100 years, streams of small particles of cosmic dust it left behind persist for centuries. The meteor shower is one of the brighter and most prolific meteor showers of the year. And luckily for us, this year’s shower is expected to be more visible than it was last August due to darker skies after the moon sets around local midnight. Expect to see as many as 50-100 meteors an hour if viewing from a place with dark skies. To see the Perseids, look toward the northeastern sky in the hours before dawn. 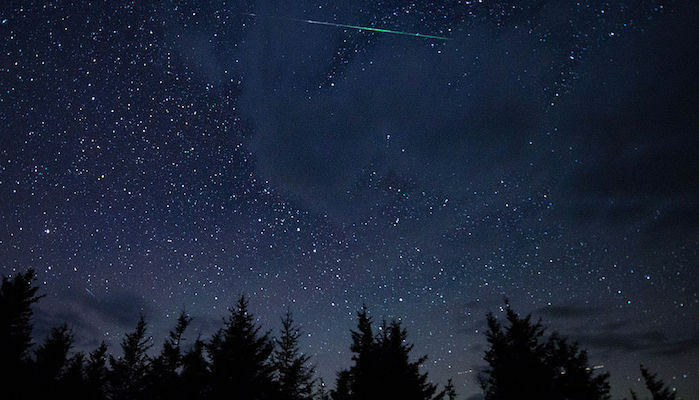 The Orionid meteor shower, the second annual shower resulting from debris shed by Halley’s Comet, is a modest shower of about 10-20 meteors an hour. Unfortunately, the second quarter moon will be out this year during the best viewing times just before sunrise. You still could get lucky, though. The Orionids are known to sometimes create bright fireballs, which could be seen in the sky in spite of the moon. Look for these meteors in the direction of the constellation Orion. The legendary Leonids meteor shower, stemming from Comet Tempel-Tuttle, has created some of the most spectacular meteor storms in history. However, in most years it produces around 10-15 meteors per hour. This year the best viewing is the evening of Nov. 17 and before dawn on Nov. 18, but as it is just three days after the full moon, viewing won’t be as good as other years. Look toward the east to see the Leonids. This meteor shower, caused by 3200 Phaethon – an unusual Solar System object with characteristics of both comets and asteroids – rivals the Perseids in terms of number of meteors it yields. This year the meteor shower coincides with a “supermoon,” which will be out all night and limit the number of meteors that can be seen. The shower’s peak is around 2 a.m., Dec. 14. We hope some of these amazing celestial events will inspire you to take a moment in 2016 to go outside, look up and enjoy our magnificent dark sky.